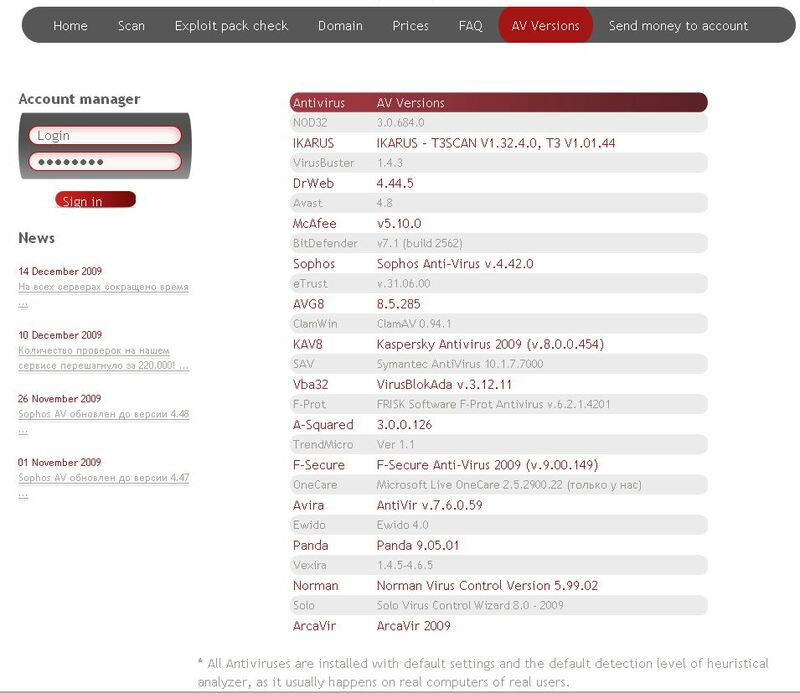 For $1 per file scanned (or a $40 monthly membership) av-check.com will see if your file is detected by any of 22 anti-virus products, including AVAST, AVG, Avira, BitDefender, NOD32, F-Secure, Kaspersky, McAfee, Panda, Sophos, Symantec, and Trend Micro. “Each of them is setten [sic] up on max heuristic check level,” av-check promises. “We guarantee that we don’t save your uploaded files and they are deleted immediately after the check. Also , we don’t resend your uploaded files to the 3rd person. Files are being checked only locally (without checking/using on other servers.” In other words: There is no danger that the results of these scans will somehow leak out to the anti-virus vendors. The proprietors of this service don’t even try to hide the fact that they have built it for malware writers. 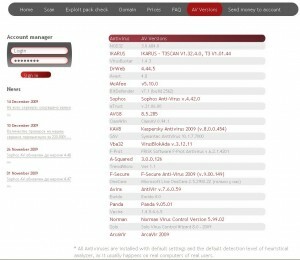 Among the chief distinguishing features of virtest.com is the ability for malware authors to test “exploit packs,” pre-packaged kits that — when stitched into a malicious or hacked Web site — serve the visitor’s browser with a kitchen sink full of code designed to install software via one of several known security holes. Many anti-virus programs now also scan Web pages for malicious content, and this service’s “exploits pack check” will tell malware authors whether their exploit sites are triggering virus alerts across a range of widely-used anti-virus software. This entry was posted on Thursday, December 31st, 2009 at 9:20 am	and is filed under Web Fraud 2.0. You can follow any comments to this entry through the RSS 2.0 feed. Both comments and pings are currently closed.